We often think of kidnapping as involving daring abductions and ransom demands for millions of dollars. But kidnapping charges in New Jersey are often filed under far more mundane circumstances. Kidnapping may arise in a domestic violence incident, when an argument between a husband and wife gets out of hand. Kidnapping can also arise in divorce cases, when a parent without full-time custody of his or her child “takes” the child. Although these situations are quite common, the penalties can be severe, including serious prison time. The Tormey Law Firm represents clients throughout Morris County and New Jersey, including Dover, Parsippany, Roxbury, Denville, Rockaway, and Morristown, that have been charged with serious criminal offenses such as Kidnapping, False Imprisonment, and Criminal Restraint. If you or a loved one has been charged with Kidnapping in Morris County or elsewhere in New Jersey, contact our experienced Morris County criminal defense attorneys for help. We are available anytime to provide you with a free consultation. Simply call (908) 336-5008 or use our online contact form to schedule an appointment at our conveniently-located Morristown office. Mr. Tormey was recognized as one of the 10 best criminal attorneys in New Jersey by the American Jurist Institute. In addition, Christopher Perry was named a SuperLawyer Rising Star in 2018 in the area of criminal defense. Both of these attorneys are available now to assist you. 4. To permanently deprive a parent, guardian or other lawful custodian of custody of the victim. 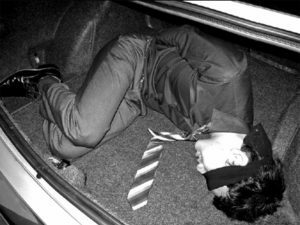 Kidnapping is an extremely serious charge in New Jersey and is typically a first or second degree crime. A first degree offense is punishable by a term of imprisonment of between 25 years and life, with the offender required to serve at least 25 years before becoming eligible for parole. The release of the victim occurred prior to their apprehension. A second degree offense also contains a presumption of incarceration and is punishable by a term of imprisonment between 15 and 30 years. Additionally, because the No Early Release Act (“NERA”) N.J.S.A. 2C:43-7.2 applies to “violent crime” convictions (such as Kidnapping, Aggravated Assault, or Robbery), an offender will be required to serve 85% of the sentence before they are eligible for parole. If you or a loved one has been charged with Kidnapping in Morris County, New Jersey, it is imperative that you contact an experienced criminal defense lawyer for representation. The collateral consequences of a kidnapping conviction are life-altering. The Tormey Law Firm can help. The skilled, experienced lawyers at The Tormey Law Firm understand the importance of an aggressive defense when you are facing serious criminal charges as a result of a domestic violence or another incident. We are ready to attack the State’s case and fight on your behalf for the best possible result. Give us a call anytime at (908) 336-5008. A member of our criminal defense team will be happy to answer any questions you have and provide you with an honest assessment of your case. This consultation about your case will be free, so call today.